The sublime union of temporal and spiritual power in the business world is celebrated in this earnest corporate hagiography. The titular monk is ex-Catholic clergyman Moore, a "thoughtful, provocative, gentle and good-natured" man with "the interpersonal skills of a priest, the serenity of a monk, the unbiased attitude of a business neophyte and a stark absence of a personal agenda." Signing on to the human resources department of gas utility Brooklyn Union, Moore becomes a confessor to troubled colleagues and a spiritual advisor to CEO Catell. As the energy market deregulates and Brooklyn Union metastasizes into energy conglomerate KeySpan, this is the story about how Moore helps the company "hold on to its soul" along the way. Consistently rated as one of the top ten business books on Amazon.com. 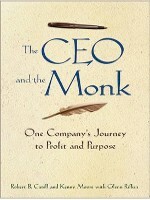 Prior to coming to corporate life, Moore spent 15 years in a monastic community as a Catholic priest. Oddly enough, both jobs have proven to be quite similar - except the Incentive Plans vary greatly. Kenny left the monastery because he wanted to get married. Now that he’s married and has two teenagers, he would like to go back. Several years ago, Moore had the good fortune of being diagnosed with “incurable” cancer, at its most advanced stages. He underwent a year of experimental treatment at the National Cancer Institute and survived. He recently had a heart attack and was invited to be sawed in half and given a quadruple bypass: a subtle reminder that his time is running short. Having dealt with both God and death, he now finds himself eminently qualified to work with senior management on corporate change efforts. Moore is President of Kenny Moore Consulting, LLC. He’s a well-regarded Keynote speaker, executive coach and business consultant for Leadership Development, Change Management and Employee Engagement. In corporate life we are in serious danger of believing that those who talk the loudest win the day. My 20 years in business have taught me that leaders who can actually keep their mouths shut and ears open have a better chance of being heard, believed and followed.